Yesterday at 10:30 am, Grey, my MIL and I packed up She-Beat to head in for surgery. I've been mentally blocking how this day would unfold, so the drive in was a bit surreal. We ended up having a 3 hour wait as the cases ahead of She-Beat's were taking much longer than expected. As we waited, my anxiety grew causing me to be more snappy and jittery. I knew we needed to do this surgery to remove the cholesteatoma, but the thought of them cutting into her made me want to gather her up and run as far away as possible. Finally we were called back to a room for surgical prep. After what seemed like forever, the surgical team was ready to take her back to the operating room. Dressed in booties, a hair net and disposable surgical gown, I carried my 2-yr old daughter back, focusing on calming her down and telling her we loved her. Not wanting to let her go or leave her as they helped her fall asleep. The long and the short of it is that She-Beat's surgery was both successful and abnormally fast. Usually removing cholesteatomas is a 3-4 hour surgery involving MRI or CAT scan to map the growth, followed by surgery through the back of the ear to remove it. She-Beat's cholesteatoma was extremely small, so MRI was already ruled unnecessary. What surprised the surgeon was how easy it was to remove. He quickly found it, sucked it out and then spent the rest of the time making sure he truly had removed it. All done through the ear channel meaning that the surgery was very minor. The results have been a super fast recovery, with only minor pain medicine required. Watching her devour her dinner last night, my MIL commented that one wouldn't know she had even undergone surgery that day. And I am beyond thankful for how lucky we've been. Still, the trauma from this experience left me in tears. Finding a secluded bathroom while She-Beat was in surgery, I finally allowed the fear washed over me. I cried over having to do this; over having to hold her while they administered the anesthesia because it was so evident how terrified she was. I cried as I allowed my mind to go to the worst case scenario. I cried because it was my job to protect her and I felt like I had failed her. Two years ago, as I lay on the operating table and listened as the Beats were pulled from my body, I made a promise to them that I would do what ever was required to protect them and help them thrive. The irony of being back in an operating room two years later still has me shaken. Granted, I knew what to do differently. As She-Beat struggled from pain, I knew to advocate for pain medicine so she could function. I knew the importance of picking up her prescription. I knew the importance of her resting and taking time to heal. And once again, I made sure to work with her medical team to get her home as soon as possible. Despite all of that and the success of yesterday, I can firmly say I never want to go through this again. That though I'm grateful for access to an amazing team of surgeons and physicians, I am also hoping this is the last surgery either of the Beats will ever have to experience. I'll end this rambling post by thanking everyone who reached out via comments, email and text for their support during this time. Both Grey and I are eternally grateful for the support and love. 10:30 pm. She-Beat lets out a whine to let us know she's awake and unhappy about being in her crib. The sound of me approaching her room causes her to jump up in her crib, leaning over in anticipation. Grey and I have tried ignoring her during these wake-ups, hoping that she'll simply fall back to sleep. Instead, we've learned the only thing that works in taking her downstairs for some one-on-one time. Playing quietly or cuddling on the couch. This night is no different, except for a looming sense of anxiety on my end. I know she's aware as she immediately puts my face in her hands and gives me a hard stare. A quick kiss follows ending with a hug where I can feel her melting into me. Quietly I wipe away the tears, instead focusing on her being pressed into my chest. In 7 days, She-Beat has her surgery. In 7 days, the Beats turn two. Back in June, we knew the irony of this event landing on their birthday. With memories of all the craziness that happened almost 2 years ago. In a strange way, there's calm around this knowledge. She's so young that it's unlikely she'll remember and yet it highlights how strong they both are as they've already had to overcome the odds before. In addition, we are lucky to have two excellent surgeons overseeing this surgery. Still, as the date approaches, my anxiety has increased. I'm scared of what will happen. Wishing it was me that would be going under the knife instead of her. On Sunday, we'll celebrate their birthday. A day at the park with access to a wading pool. Their friends and teachers from school have been invited with the only request being they come and play; a day to forget what is looming and focus instead on celebrating them coming into the world. One week till surgery to remove the cholesteatoma. One more week to pray and prepare. When my mother was 11 yrs old, she suffered an accident that resulted in her being burned in over 70% of her body. As legend goes, she went to refill a lighter, spilling some of the lighter fluid on her clothing and then tested it to make sure it worked. My grandfather found her engulfed in flames, covering her with his body to extinguish them. At 11 yrs old, she suffered physical pain most never will know, with the burns being so bad that she was given last rites as even the doctors believed she wouldn't survive. Miraculously my mother did survive. But the scars from the trauma, both physical, psychological and emotional, have haunted her ever since. For the most part she has risen above this experience, going on to find love and build a family. Outwardly it has appeared to all that she conquered this trauma. But I can tell you as her daughter, the demons from this experience remained. I won't begin to imagine I can speak for my mother as I don't live with these scars, but I will speak to being the child from one who survived something so traumatic. That even though my mother's physical scars were rarely at the forefront, how my own body issues were exacerbated by the pain caused by them. How the control she tried to maintain over everything being "normal" negatively impacted me, causing me to put great amounts of physical distance between us. How ultimately all of this lead to me cutting her out of my life as it was far less painful then living with the abuse and rejection from my diagnosis. How I'm still so angry at her for how she hurt me. And how I'm also so sad. So incredibly sad because now, after surviving my own trauma complete with its own scars, I know things didn't have to be this way. In the summer of 2012, before my final round of treatment and before a clear road ahead became apparent, I was faced with the reality that I needed to find a way to begin healing from infertility in order to save my sanity. Since learning about the existence of the Beats, there's been even more of an urgency as I've worried about repeating the cycle I learned from my mother's trauma; tainting their lives with the demons that haunt me. As painful as it was, I began looking at the shattered pieces of life and began the process of sorting and placing them back together. In some areas those pieces came together quite nicely, with only fine cracks visible, but in other areas the holes that existed needed to be filled. The question was, how does one fill those holes? In most cases, what is promoted is filling them in a manner to mask the scars. Repair the damage so as not to highlight the trauma. But I knew from the beginning that this method wasn't for me. Hiding the scars seemed counter to what I had learned and what Grey and I had gained. 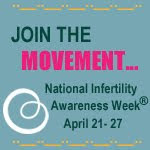 Minimizing the damage from infertility and all the loss associated with it made it feel like we should be ashamed. A few days ago, while browsing Pinterest, I came upon the following image, which made me catch my breath. Following the link, I began reading about a Japanese art form called Kintsukuroi. 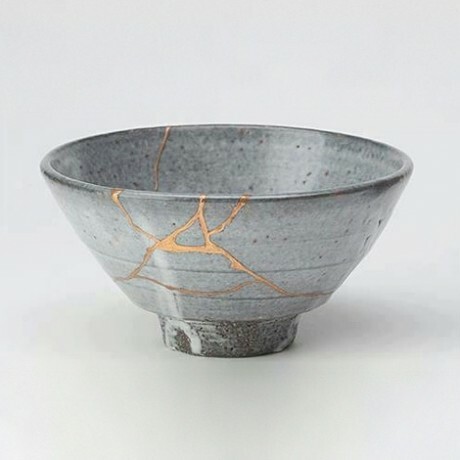 As I read about this art form for repairing broken pottery, I learned about the philosophy behind the practice: treating breakage and repair as part of the history of the object, rather than something to disguise. Kintsugi has recently been embraced by popular culture, with Seattle in particular being abuzz. The philosophy, though, is an ancient one where embracing flaws and imperfects is celebrated. Quite counter to what most in our society were educated to do. By highlighting the damage and wear, instead of hiding it, one is demonstrating the potency of the experience. The change that can come about. And the beauty of the scars. Unknowingly, Grey and I have been embracing Kintsugi for the past 3 years. It's easily argued that we can do so because our journey ended the way it did, almost fairytale like. But the truth is, trying to heal the other way wasn't for either of us. Granted there are moments where the road to healing this way has been extremely rocky. I know I've stumbled and fallen a lot along the way, but I've been lucky to have so many mentors who've shared their own journey. The journey towards healing isn't over. With new chips and cracks surfacing along the way. But I'm learning to do more than simply live with my scars; I'm learning to marvel at their beauty. Two Sunday's ago, Grey and I abandoned our usual weekend morning routine and packed the Beats in the car for a trip to the zoo. Despite our local zoo being less than 3 miles away, it had been years since we last ventured through those gates. Grey was nervous for what would unfold as both Beats were fully in toddler mode. To his relief and delight, the 2 hours spent there were ones where both kiddos ran along the paths, stopped briefly at each exhibit to wave "hi" to the various animals, all the while wearing themselves out for a nice long nap for the whole crew. Like many, I've always had a list of activities I assumed I would be doing one day when I had children. Trips to the zoo, the aquarium, local museums, the beach and even the park were givens. After a diagnosis of infertility and multiple failed rounds of treatment, that list became front-and-center in my life of places both to avoid and assuming we would never get to experience. In the midst of the darkness, these places became reminders of what we didn't have and assumed would never be. Before our last treatment cycle, David and Dee actively challenged this list I had generated. Why was I excluding myself from places and opportunities that I once loved? The fictional banner that I draped over these places was doing me more harm than good and considering most young parents were reclaiming bars, why could I do the same. So, with guidance, I created a bucket list to counter infertility. A list of things I would once again embrace in order to reclaim the life I deserved to be living. Trips to the bench, visits to local parks, berry picking, hiking local trails, etc all came to the forefront. And for those things that didn't appeal without a younger human in tow, a promise to bring a child that was in my life along as a way of capturing the experience. This summer has been one where we've been going through that last portion of the bucket list. And though I am taking the Beats along with me on these adventures, I'm still acutely aware how different these experiences are now that we have resolved.